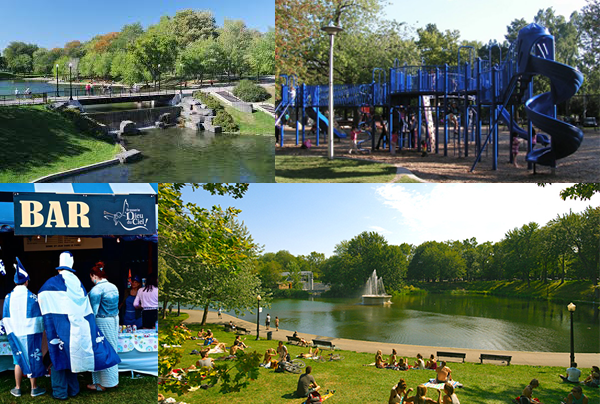 Although you have a ton of options for this weekend to get outside and enjoy the glorious weather (much of which will be brought to you by Saint-Jean-Baptiste / John the Baptist), my recommendation for you is the oldie-but-a-goodie Parc La Fontaine in the Plateau Mont-Royal. The park will be rife with St-Jean festivities tonight and all day/night tomorrow so if you’re into gigantic celebrations with hundreds of your closest friends, hit it up! There are even water features for kiddies in the park so no worries about the heat for your wee ones. Also, although you can no longer rent boats to float down the two ponds, there are certainly spots to hop in knee-deep anyway (just don’t let the fuzz see yah 😉 You have your pick in terms of sports to try in the park on any given day – Bocce, volleyball, soccer, baseball, water games, frisbee, slack-lining, etc (bring your own equipment or join another group already havin’ fun). There is space en masse so you won’t have any trouble finding your own little private spot somewhere in the park’s 100 acres of glory. Even if all you want to do is laze away the day, man, Parc La Fontaine is your city oasis, no doubt! As far as St-Jean goes, there will be activities and events galore for everyone – wee ones to old ones and everyone in between. The major St-Jean party will be down in Quartier des Spectacles (moved there from Parc Maisonneuve in 2015) so if you want a big, huge party, go there. Otherwise, the festivities at Parc La Fontaine will give you a much better “outside” experience, in the middle of a beautiful park with tons to do, and without the huge crush of thousands upon thousands of people. Espace La Fontaine, right smack dab in the middle of the park, has some great food and ice cream so no need to bring your own food… but definitely your own money. I’d recommend entering into the park via the corner of Rachel & Calixa-Lavallée – there’s a wonderful colonnade running southwest from there that brings you down to the water’s edge. Damn easy to get there by public transport… like daaaaaamn easy! There are not a ton of bathrooms. And, well, after a few beers or radlers or even water, that can become troublesome. Théâtre de Verdure is still not open. It’s supposed to open next year, in time for Montréal’s 375th but damn I miss those free movies, theatre and concerts (they are however trying to make the best of it). You can’t rent any sports equipment (except skates in the winter). I know I’m being picky here, but that would be cool. One of my favourite close haunts to hit, and a perennial provider of birds in the hand, Mont-Saint-Hilaire never disappoints when it comes to a winning day-hike. I’ve visited during burning summer sunshine, crisp autumn downpours and muddy Spring slugs – all of which have been marvelous. Oddly enough, most of the mountain is currently the property of McGill University, known as the Gault Nature Reserve. The University has opened the western half of the mountain to visitors (at a fee) for hiking, and cross-country skiing, as the Milieu Naturel. The eastern half, or Milieu de Conservation is not accessible to the general public. The flora, avifauna and geology of the mountain make for a pretty magical place if you’re willing to stop, look and revel. There are more than 185 species of birds (including peregrine falcons), 372 known types of minerals (of which 50 are new to science), 400-year-old trees and a plethora of butterflies. To experience all of this, I recommend starting with the Pain de Sucre trail, and then returning, or continuing up to Dieppe via a path of your choosing. You can create myriad trial-combos so have at it and choose your own adventure! If you haven’t scarfed all of your beef jerky and tuna sandwiches upon your descent, then go ahead and end your hike with a nice little chill by Lac Hertel… aaaaand relax. Close to Montréal, like less-than-45-minutes-away kind of close. If you wanted, you could even take a train there! Although many people traipse through this beautiful mountain, there are many forces working to protect it including McGill University, UNESCO and Environment Canada. 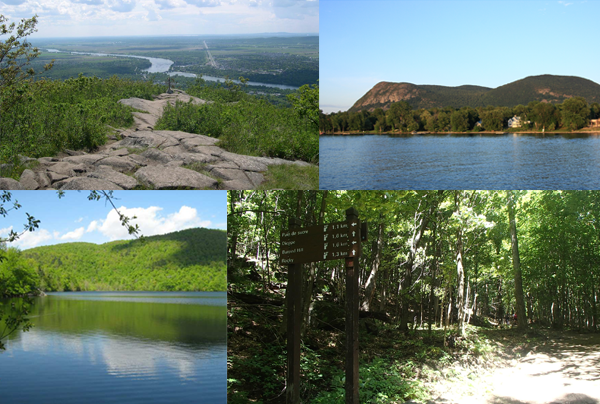 You can contribute to the Mont-Saint-Hilaire Tree Inventory… which is…. weird, but oddly fulfilling. There is construction on the main access road and the town of Mont-Saint-Hilaire is celebrating its 50th anniversary (of sorts) this year… Means you may get bogged down in some annoying traffic. There can be loads of people on those perfect days. I’d recommend hitting it early, or bide your time and hit it late afternoon. It’s close enough to Montréal and has enough short hike options to make that possible. Lac Hertel is closed to recreational swimming. I understand the reason for this (it is, after all, a secondary reservoir of drinking water), but c’mon ref! Can’t we just have a little ol’ time outdoors fun anymore? At the summit (Pain de Sucre in particular), take a moment to just sit, with your hand extended, and rest assured, a bird will come on by and perch down on you. However, please don’t lure with food (it’s unhealthy and completely unnecessary).